Containers are great additions to any garden as a way of bringing color and interest right into the areas where you make the most use of your garden. A lot of activities take place on decks, patios, terraces and balconies, where of course there is no soil to plant directly into. Maybe you have a small garden or no garden at all, but you may have a deck or terrace that you can decorate with plants. Whether you have built-in planter boxes or just use tubs and pots, most of us buy annual flowers each year and only think of low plants to provide color. That is of course a great thing to do, but it’s also a good idea to think up. Trees, especially those with flowers or colored leaves, will not only create vertical structure and interest, they will throw some welcomed shade if your terrace is sunny, perhaps perfume the air and certainly give some permanent structure and a mature appearance to any space. 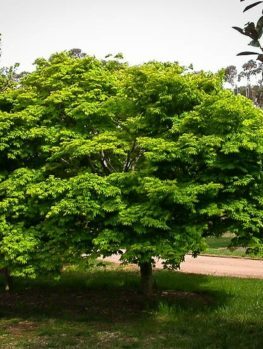 What Kinds of Trees Can You Plant? 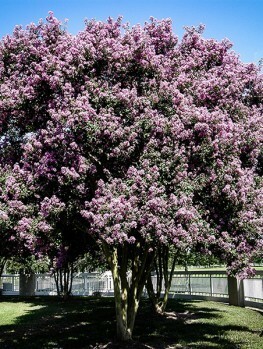 The most obvious choice is a flowering tree that will be festooned with seasonal blossoms and color. 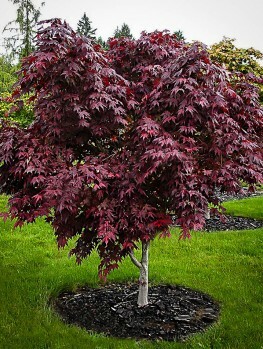 Another choice could be a tree with attractive foliage that will color in the fall. 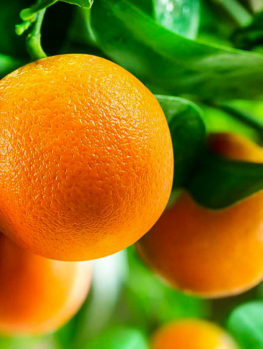 If you choose fruiting trees you can even have home-grown produce right from your deck even if you have no garden at all. A sheltered terrace may also allow you to grow a more tender plant than will grow out in the garden, and if you have an indoor space for the winter, container planting allows us to grow tender trees that certainly wouldn’t survive outdoors all year round. There are lots of choices available for both sunny and shady areas, so the range of trees available for container-growing is large. A practical purpose can be satisfied too. If you have moved into a new property you may not be ready yet to plan and plant your garden, but you know what trees you want to have. So consider buying them now to take advantage of sale prices or the lower price of smaller plants. 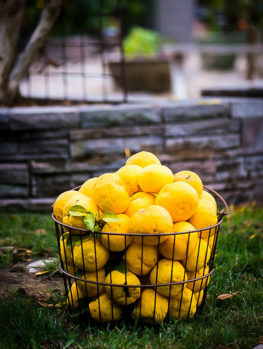 Plant them in containers and use them to decorate your terrace or deck while you prepare your garden and plan the final location for your trees. By the time you come to plant them, they will have grown taller and larger, ready to make more impact straight away, while saving you money. 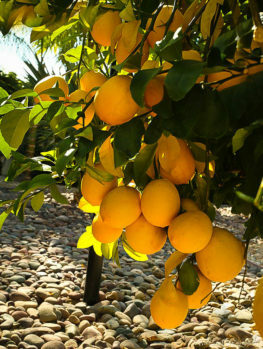 For long-term container planting, choose trees that are slower-growing or smaller in final size. 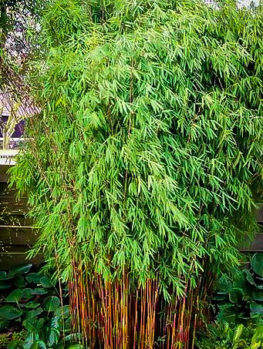 These trees will live happily for many years in a container or planter box and give you lots of value with shade and flowers for season after season. Below we have included some ideas for trees to grow in containers. 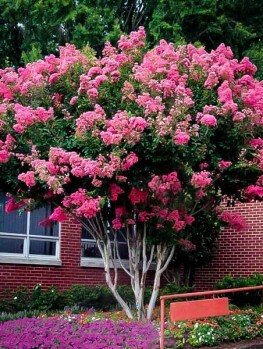 Top of the list for flowers all summer long, plus a spectacular fall display, are the Crape Myrtles. 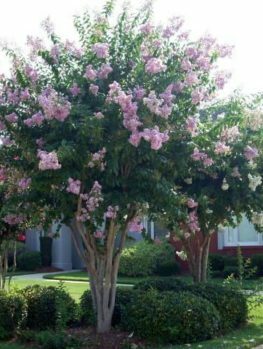 These flowering trees are full of blooms during the summer months, just when you are most likely to be on your deck relaxing or entertaining. With their wide range of colors they give a real lift to any space and in fall the foliage turns brilliant shades of red and orange. Not only will these trees be continuously in flower all summer long, but since they are very drought hardy they will survive a little neglect and happily grow in a container for many years. 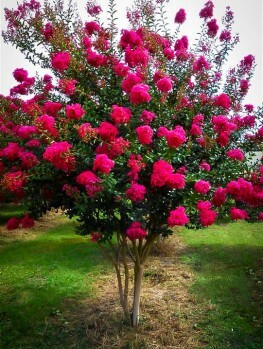 The cherry-red Dynamite Crape Myrtle is one of the best choices for a container, growing to perhaps 10 feet tall. 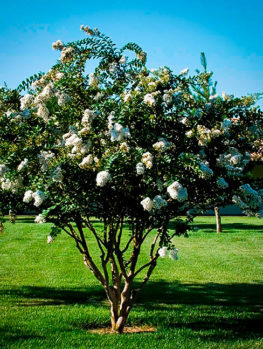 Others, like the bright white Natchez Crape Myrtle, will grow a little taller but with spring pruning can be kept more compact if necessary, for a smaller space. 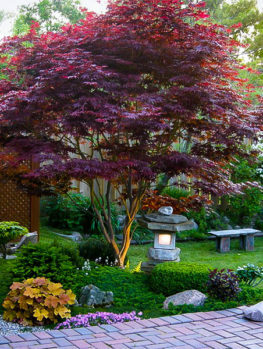 If you have a slightly shady terrace or deck and especially if you want an oriental theme, then one of the many ornamental Japanese Maples is an ideal choice. 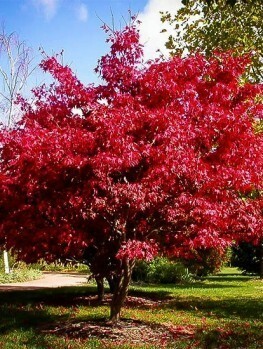 Although flowers are insignificant, these refined and graceful trees make up for it in the delicacy of their deeply-divided foliage and summer and fall interesting colors. 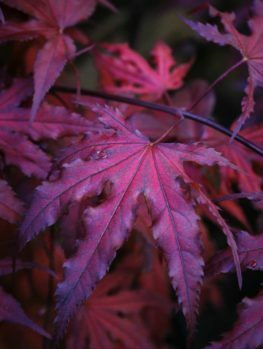 You can have a taller, more upright tree by using the Crimson Queen Japanese Maple (or the Bloodgood Japanese Maple in a colder area) for brilliant red leaves all summer long. 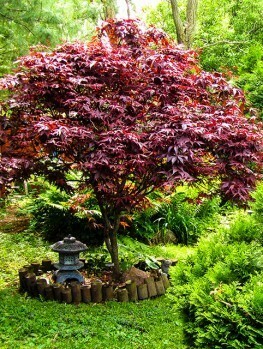 Or you may prefer a bonsai look, easily achieved without any special pruning by growing one of the weeping forms like the Waterfall Japanese Maple or for red summer leaves the Garnet Japanese Maple. 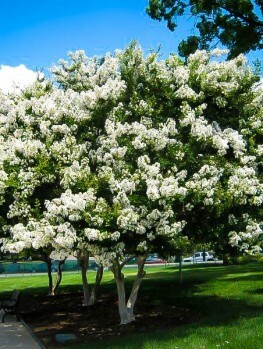 Whatever choice you make from the many varieties available, these elegant trees only increase in beauty (and value!) 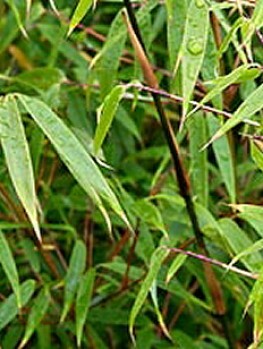 as they mature. 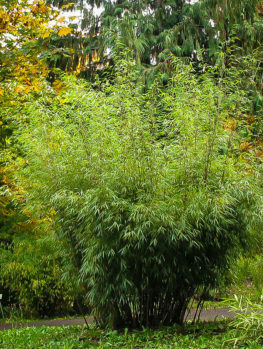 Not really trees at all, but giant grasses, Bamboo Trees are a very different choice for a container planting. 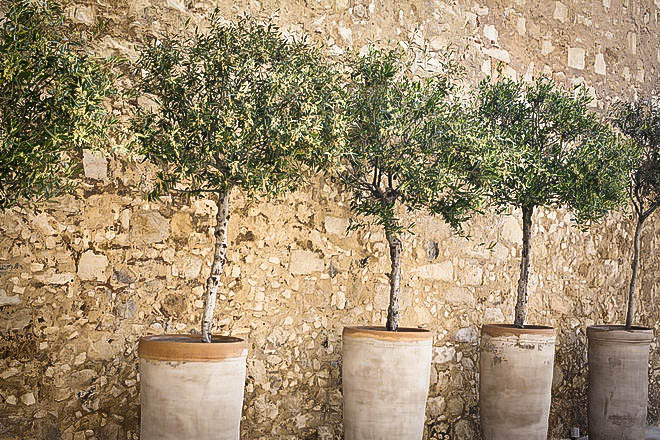 With these rustling leaves on graceful stems their unique narrow, upright form is ideal to give height on a terrace or balcony without taking up a lot of room. 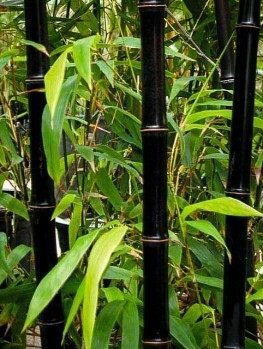 For great contrast in a modern setting, choose Blue Fountain Bamboo, with its grass-like stalks. 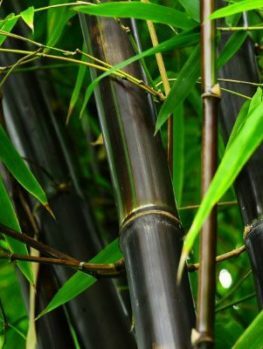 For a smaller container, choose Umbrella Bamboo, which forms a dense clump less than 10 feet tall when grown in a planter. 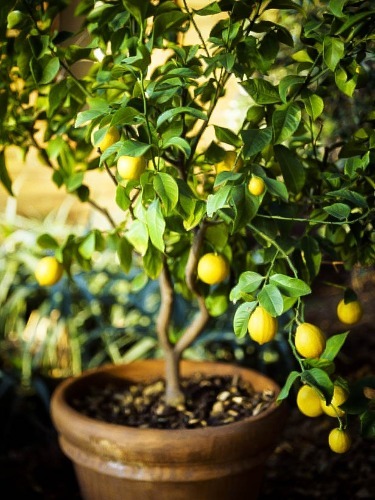 In warmer climates, the iconic citrus trees make ideal container plants. Since these plants need warm conditions, in colder areas the containers can be brought inside during winter, allowing you to enjoy the powerful fragrance of the blooms and the beauty of the developing and ripe fruit all spring and summer outdoors, even in cold regions. 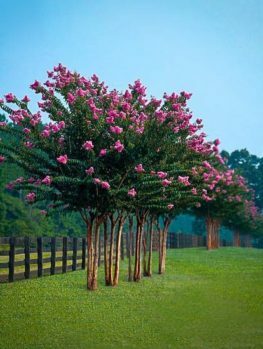 These trees will give a touch of the exotic to a northern garden, or be right at home in the warm of southern states. 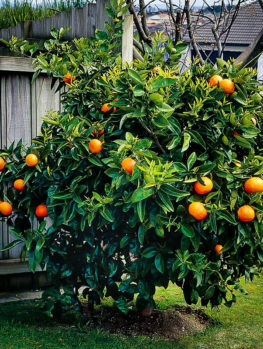 The Nagami Kumquat is an ideal choice for a container, covered all winter with tiny fruits and hardy to 150F, it will overwinter in a porch in many milder regions with no problem at all. 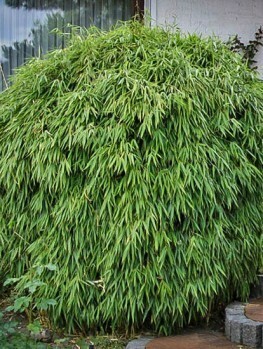 It rarely grows above six feet and so can be fitted into any small, sunny spot. 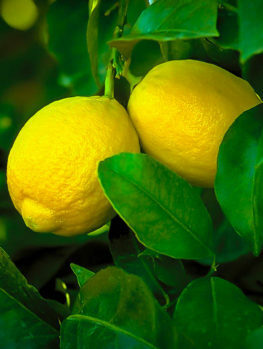 For a lemon tree it is hard to beat the Meyer Lemon tree, with its gourmet mildly-flavored lemons produced in profusion and available over several months. 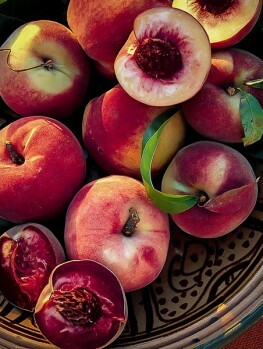 Imagine picking ripe peaches from your patio. What a luxury that would be! 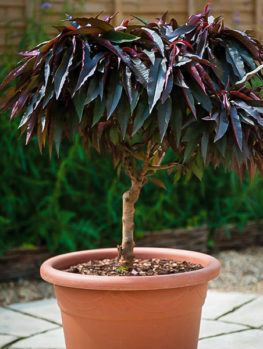 With an Elberta Peach Tree in a large pot, you can do just that. 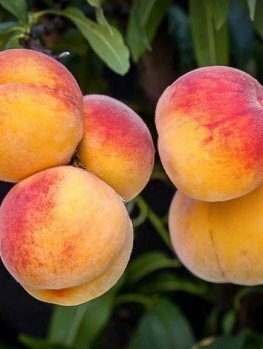 This heirloom variety is hardy from zone 5 to zone 8, bears fruit in just three years and doesn’t need another peach tree to pollinate its flowers. 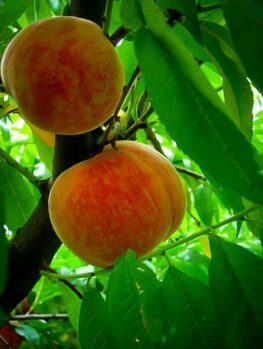 It is rarely found in stores because it needs to be tree-ripened to give it the luscious sweetness we expect from a peach. 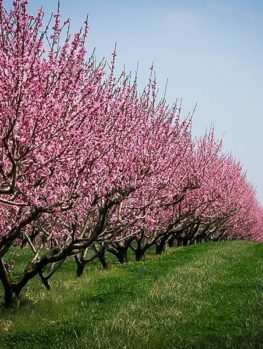 As if a crop of fresh fruit was not enough, the rich pinky-purple flowers that smother the bare branches in spring are so beautiful they are enough even without the fruit. 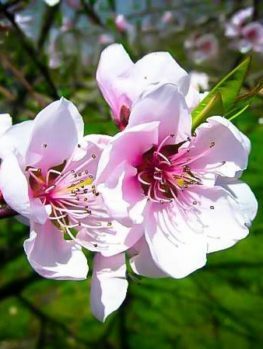 But probably the perfect peach tree for a container is the Bonfire Patio Peach Tree – its name says it all! 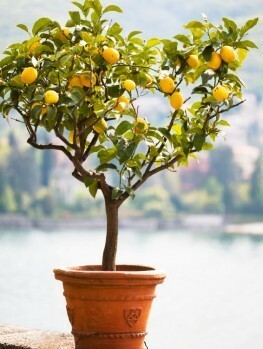 A few simple steps will make sure your potted tree does well. Watering is of course essential. Plants in containers should be thoroughly watered, until water flows from the drain-holes, every time they are watered, but allowed to become a little dry on the surface between watering. Simple drip-irrigation systems can be set up for pots that will take a lot of the work out of growing a larger number in pots. In winter less water is needed for deciduous trees, but don’t let them dry completely. Fertilizing is essential for good results and liquid fertilizers are the easiest way to go. 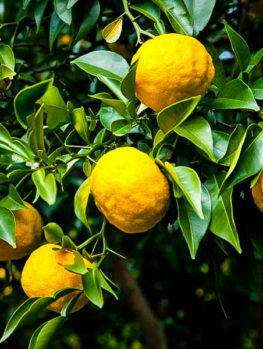 For organic growing use fish emulsion or other liquid products, or just use any suitable liquid fertilizer for flowering trees. Avoid fertilizers designed for evergreens or hedges, which will encourage too much green growth and fewer flowers. If you need to prune, do it during the late winter when your tree is dormant. 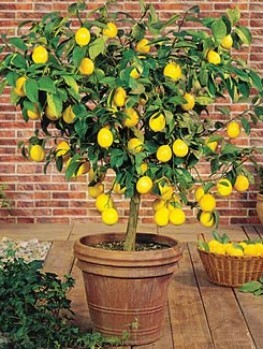 Once you start growing trees in pots on your patio or deck, you will wonder why you never thought of it before. It is easy to do and the results can be spectacular, really giving structure and interest to these areas and moving on from the ordinary pots of petunias so often seen. Even if you have no garden at all, your balcony or terrace can be a refuge of trees from a busy life. What are the trees in the row of pots pictured at the head of this article? For my front yard , how big do they get ? AND THE OTHER ONE IS CALLED RED ROCKET THEE , HOW BIG WILL THAT ONE BE ? THANK YOU PAULA .